The St. Mary’s University School of Law will host the Centennial of the Constitution of Mexico Celebratory Conference on Friday, Feb. 3, in the courtroom of the Law Classrooms Building. In honor of the 100th anniversary of the Mexican Constitution of 1917, the conference will create a space for dialogue about critical issues related to the future of Mexico-U.S. relations. “In these times of great discussion regarding Mexico, we believe there is room for thoughtful study of its laws,” said Stephen M. Sheppard, J.S.D., Dean of the School of Law. Speakers will include the Honorable Julian Castro, former mayor of San Antonio and U.S. Secretary of Housing and Urban Development; Ministro Alberto Pérez Dayán of the Supreme Court of Mexico; the Honorable Erika A. Rodríguez Hernández of the Chamber of Deputies for the LXIII Legislature of the Mexican Congress; and the Honorable Ernesto Martens Rebolledo, former Secretary of Energy for Mexico. 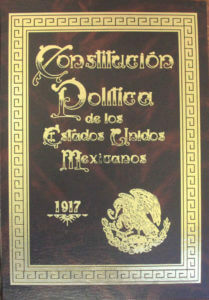 Topics of discussion will include the Constitution of Mexico, Mexico’s Supreme Court and the Mexican Federal Congress. It will also include a discussion of the upcoming U.S. Supreme Court case Hernandez v. Mesa, which stemmed from the incident of a U.S. border patrol agent on U.S. soil fatally shooting a Mexican teenager standing across the border in Mexico. St. Mary’s Law provides “the ideal forum to promote argumentation, reasoning, reflection and a route to find solutions to the realities experienced by both countries today,” Rosas added. The conference will last from 8:30 a.m. to 6 p.m. on Friday. Conference registration is $50, which includes 8.25 hours of CLE credits, lunch and a fiesta following the conference. View the complete schedule. Those traveling to campus by car are asked to park in Lot D near the NW 36th Street entrance.